NextGen Gaming’s King Kong Fury Slot is based on 2017’s blockbuster movie “Kong: Skull Island.” This time, Playn’Go and Netent have not acquired the rights to this game. Good thing because NextGen has developed a great slot full of action. The focus is of course Kong and all sorts of bonus features. These make the King Kong Fury slot a must for any slot lover. We can promise you that this game is exciting and very entertaining. If you want, you can also play the King Kong Fury here for free. Kong’s Call Feature: With this feature activated in the base game, you can get up to 12 Kong Wild symbols on the reels 2,3 and 4. Pay attention to the roar of King Kong because then the feature starts. Lightning Reel Feature: As you suspect, this feature enlightens one of your reels. Then up to 15 primeval animals appear. One of these animals symbols then spreads to your paylines and gives you a nice extra profit. Skull Island Free Spins: The Free Spins feature on the King Kong Fury slot is triggered by the bonus symbol of Anne Darrow. You get a 4x instant win and now you still play for the number of free spins. You get at least 9, but it can be up to 100 Free Spins. In the Free Spins you get multipliers and also have the chance to get more Free Spins – without limit! Raging Free Spins Feature: The re-spins feature is triggered within the Free Spins feature. If wild symbols cover a whole reel you will get a re-spins each time. The Wild symbols stay stacked during the re-spins and trigger bigger wins. For every full stack of wilds, you get another re-spin. The King Kong Fury slot has a return to player of 96.7%. The minimum bet per payline is £ 0.01 – £ 0.50 per spins. You can bet up to £ 250 for every spin. The maximum profit is £ 500,000! 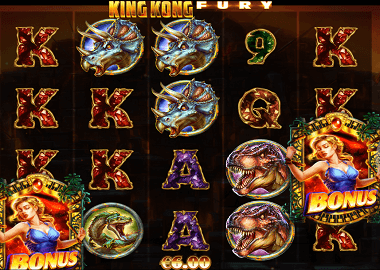 King Kong Fury is thus for convenience gambler as well as for high rollers. First of all, you can play the King Kong Fury here with us for free. Open the slot by clicking on the top banner. If you also want to play for real money, we can recommend a number of good online casinos. NextGen slots are compatible on all platforms: desktop, tablets and smart phones. Thus, you can register in all online casinos, no matter where you are. Of course, you should also redeem the bonuses and free spins – a nice advantage for you as a new player.